Buy an energy efficiency dish washer and make sure it is at least 90% full before you run a load. Buy a water heater blanket to keep your water heater insulated. 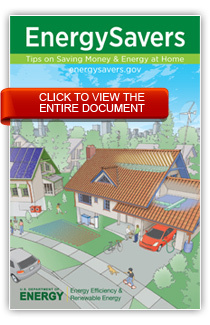 You’ll save approximately $40 per year. Replace incandescent bulbs with energy-efficient compact fluorescent bulbs. For each bulb replaced you’ll save up to $50 over the bulbs lifetime. Up to 16% of your heat can escape through unprotected windows. Try closing drapes at night or install insulating shutters to retain heat. 75% of electricity used by home electronics is consumed while “off”. Use a power strip and switch it off when not in use. Don’t water the gutter or concrete. Make sure your sprinklers are positioned to water the lawn or garden and not paved areas. Also, try to avoid watering on windy days. Don’t let the hose run while washing your car; only use the hose for rinsing. This simple step can save as much as 150 gallons when washing a car. If possible bring your car to a car wash.
Ride your bike or try Space Coast Area transit. The City has a great network of sidewalks and paths that can burn calories instead of gas! (provide a link to sidewalk/bikepath map) – check with Elia. Use cruise control when highway driving. Improve your fuel efficiency by about 15 percent by driving at 55 mph rather than 65 mph, so follow speed limits. Avoid idling. It uses more gas then stopping and re-starting your vehicle. Avoid drive-through restaurants. Instead, park and go inside. Put items inside the vehicle rather than on roof racks to reduce drag. If possible, remove roof racks when you are not using them. Avoid quick acceleration or sudden braking unless your life is in danger. Avoid tailgating because it requires more braking and accelerating. Give your vehicle a regular tune-up. Keeping your vehicle in top condition means it will run efficiently and get more miles to the gallon. Regularly check your vehicle’s tire pressure – poorly inflated tires waste gas and cause more pollution. Use dimmers and motion or occupancy sensors to conserve energy. Use natural lighting or day-lighting and turn off unnecessary lights near window when it is bright enough outdoors. At the end of the day, make sure to turn off computers, printers and photocopiers. Use technology for video, phone or Web conferencing to reduce the need for business travel.